Since we first went online in 1996 with our Internet-based eyewear store, our dedicated opticians have accumulated a number of tips and tricks to help our customers with making the most of their eyeglasses, frames, corrective lenses, contact lenses, reading glasses and sunglasses experience, so we thought we'd share the best of them with you. 1. Go rimless - Combine lightweight, rimless eyeglasses frames with anti-reflective lenses for almost invisible corrective eyewear. 2. Get personal - Have you considered personality glasses? Even if you don't need corrective lenses, a pair of stylish frames with plain lenses may be a great way to change your look in seconds. From the beautiful bookworm to the glam god just pick your pair, add clear anti-reflective lenses and change your entire look in a flash. 3. Keep it clean - You would be surprised at how many people do not know how to properly care for their eyeglasses once they receive them. Using a mico-fiber cleaning cloth is best (we send one to every customer). Also, wetting the lenses before wiping with the cloth is a good idea. Washing lenses with a non-ammonia dish washing detergent or some store bought lens cleaner is the best way to preserve the coatings on your lenses. We are told that the cleaning cloth we provide to our customers is washable as long as you do not use any fabric softener or fabric cloths in the drying. 4. Clear the fog - Water goggles will not fog if you clean inside and out with dish detergent and then let them air dry. This will also reactivate the anti-fog if it has been a while since the purchase. However, do NOT use water on the lenses before cleaning as it will cause additional fogging. 5. Colorize - Lens colors can make a difference. For instance, amber or brown colored polarized lenses are great for tennis, skiing, boating, fishing and driving. Yellow lenses work great for hunting and shooting. Gray is great for golf, water sports, driving and flying. Vermillion or rose are good for skiing and fishing and green is a good all-purpose lens color. 6. Watch your backside - Anti-reflective coating on clear lenses is to increase light transmission. Sunglasses tints by design are to decrease light transmission. Using polarized high quality lenses will block glare with excessive darkening by the amount of light that is being limited to reach the eye. Using backside anti-reflective coating will almost stop completely the reflections when the sun is behind you or light reflected where it hits the back surface of the lens. 7. Screw loose? Have a problem with screws backing out of your frames? Coat the screw with a little clear nail polish. This keeps them from backing out and they still be removed if needed. Be EXTRA CAREFUL not to get the polish on the lenses. 8. Computer vision - All computer users who spend 3-9 hours a day on the PC will strongly benefit from computer glasses. 9. Skip the polish - If you have night time driving issues, even if you add anti-reflection, you can still have glare rings if you polish the lens edges. Polished edges are simply cosmetic and don't aid in visual acuities. So, if you drive a lot at night, you might want to skip the lens edge polish. 10. No free ride for cosmetic contacts - For contact lenses that change eye color without power (plano lenses), you still must have a doctor's prescription. Contacts are a medical device and if not fit under a doctor's supervision, can cause a range of eye health problems. 11. Be exact - If your contact lens prescription is written for one specific brand, i.e. Acuvue Oasys, you must order that exact lens. We (or any other merchant) cannot legally change the prescription to another brand, i.e. Freshlook Colors. The contacts have to be ordered exactly as the doctor has written on the prescription or the doctor has to rewrite the prescription should you want something different. Every contact lens fits differently due to base curve and diameter and only your eye doctor can determine a safe fit. 12. 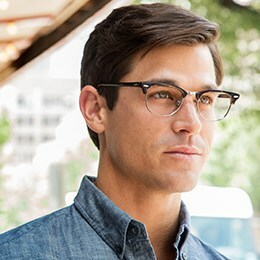 Hide it - A trick to hiding edge thickness on heavier prescriptions is to select a frame with wide temples (arms). 13. Bounce it - If you are trying to eliminate glare in a photo with eyewear raise the temples to bounce the flash down out of frame. We'll be adding more tips from our opticians to this page in an ongoing effort to provide the latest in eyewear and optical information for our readers.